Hydrogel is a water-insoluble polymer chain network that provides moist wound surface owing to high water content (90% water in the gel base). 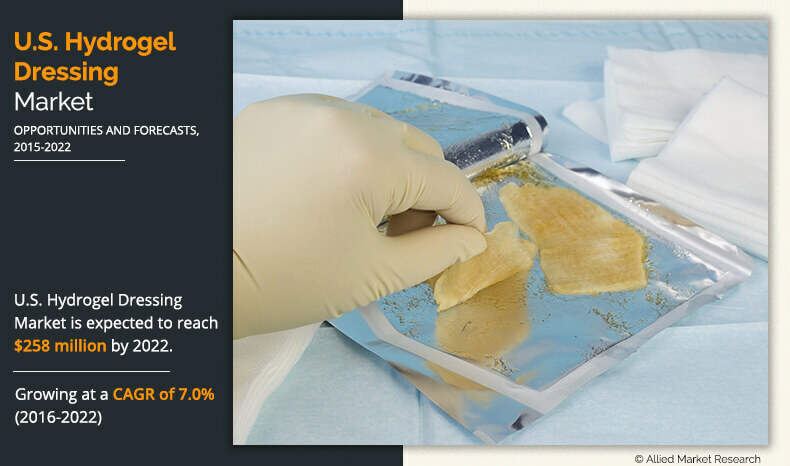 Hydrogel dressing is an essential component in wound care as its high moisture content helps prevent the infections by obstructing microorganisms. It holds moisture on the surface of a wound, which helps in pain management and provides an ideal environment for wound cleansing of autolytic debridement. Hydrogel dressing is used for dry, necrotic wounds, sloughy, granulating and epithelializing wound care. They are also used for the surgical wounds, skin tears, burns, pressure ulcers, and diabetes-related wounds. The U.S. hydrogel dressing market is estimated to generate $258 million by 2022, with a CAGR of 7.0% from 2016 to 2022. The increasing incidence of diabetic patients with clotting disorders and increasing number of accidental emergencies, especially burn injuries, led to the substantial requirement of hydrogel dressings for wound care. In addition, increasing adoption of hydrogel dressings as a substitute for traditional gauze for wound care applications is one of the key drivers of the market. Moreover, technological innovation in wound closure techniques, namely, injectable stimuli-responsive amorphous hydrogels for stopping bleeding in trauma cases and military personnel, further supplement the market growth. On the contrary, factors restricting the market growth are the high costs associated with the manufacture of hydrogel dressings and long lab to market pipeline period for healthcare products. This report segments the U.S. hydrogel dressing market on the basis of product type into amorphous hydrogel dressing, impregnated gauze, and hydrogel sheets. Amorphous hydrogel dressing emerged as the leading segment, accounting for close to one half of the overall market in 2015 and is estimated to maintain the lead during the forecast period. The demand for amorphous hydrogel dressing rises with increasing awareness about the product and its benefits. Key market players, such as 3M Company and Johnson & Johnson, adopt capacity addition and promotion of the benefits of the product over traditional wound closure products as their key strategies. Recent advancement in chitosan hydrogel with human amniotic membrane has increased the scope of hydrogel dressing in tissue engineering and regeneration. In the year 2013, scientists successfully tested the amniotic membrane extracts (AME) and chitosan hydrogel dressing, also known as biological dressings, for treatment of partial burns. The key reason for the development of these dressings is that they provide improved healing results when compared to single-layered conventional wound dressing systems. This report provides an extensive analysis of the current trends and emerging estimations and dynamics in the global U.S. hydrogel dressing market. The market scenario is comprehensively analyzed in accordance to the key product types. The market estimations are based on high-end analysis of the key developments for the period of 2015&dash;2022. Extensive research is done by product type, which instils a clear understanding regarding the current trends. 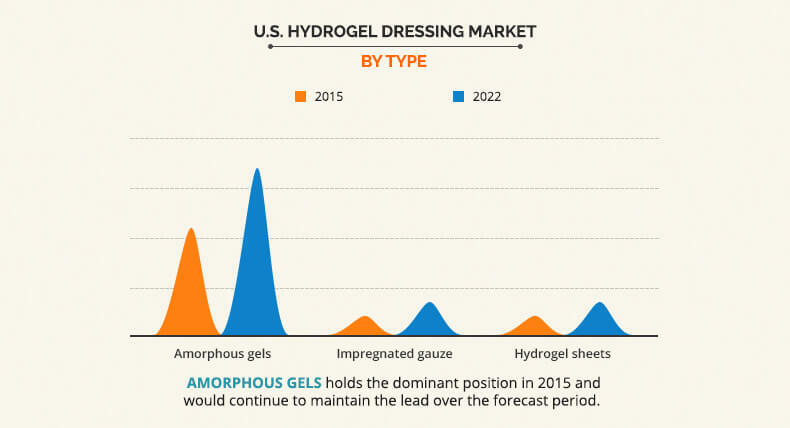 Recent developments, key manufacturers, their market shares, and upcoming products have been listed to analyze the competitive scenario of the U.S. hydrogel dressing market. Scenario beyond 2022 till 2027 has been explained through contingent patterns based on moderate, rapid, and slow growth rates of the U.S. market. 3.4.1.1 Rising incidences of burn injuries, number of diabetics and trauma cases in the U.S.
5.7 Smith & Nephew Plc. FIG. 10 SWOT ANALYSIS ALLIQUA BIOMEDICAL INC. FIG. 12 SWOT ANALYSIS OF AMERX HEALTH CARE CORP. FIG. 14 SWOT ANALYSIS OF BSN MEDICAL INC. FIG. 18 SWOT ANALYSIS - CONVATEC INC. FIG. 20 SWOT ANALYSIS - COLOPLAST A/S. FIG. 21 SWOT ANALYSIS OF GENTELL INC. FIG. 24 SWOT ANALYSIS OF SMITH & NEPHEW PLC. FIG. 28 SWOT ANALYSIS OF 3M CO.